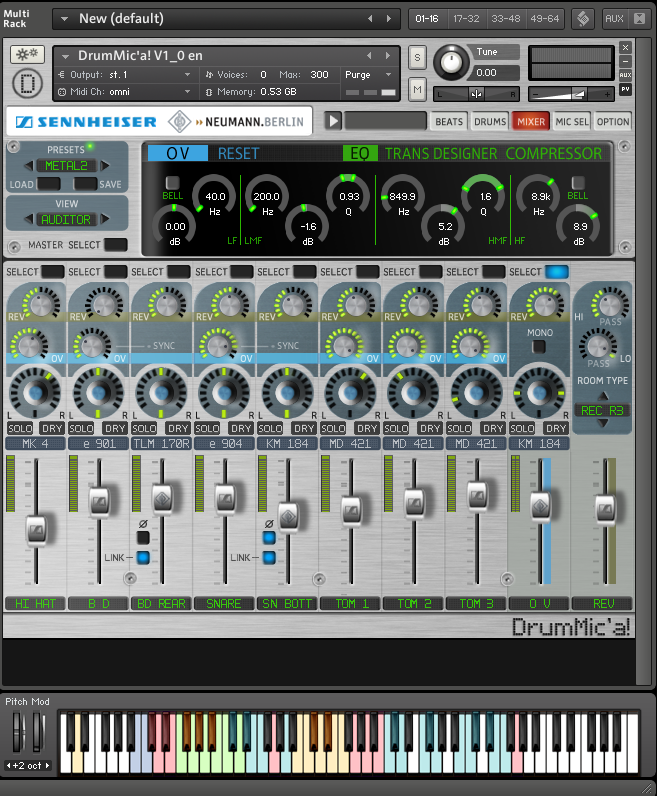 With the new, free sample library called DrumMic’a!, Sennheiser will allow a direct comparison of different microphone-positions on a complete drum kit. DrumMic’a! is a virtual instrument for Kontakt 5 Player from Native Instruments, and contains more than 9 GB of data, nearly 13,000 24-bit samples. The software can be run standalone or as a plug-in. For the production of the library, an acrylic drum set by Wahan – a drum-manufacturer located in Mainz, Germany – was selected. Signals were recorded on a SSL 4064 E mixing console. Recordings were intentionally realized without the use of external effects devices. But there’s an integrated mixer available in DrumMic’a! for post-processing purposes. DrumMic’a should provide a more natural feeling as close as possible to a human player, depending on velocity and position with up to 25 velocity layers. I have spent a couple of hours installing and testing the Drummica plugin. The download is about 4GB…the NI Kontakt 5 player is included in the package. (The plugin needs to be registrated at Sennheiser to get the activation code – everything is in german…so your school german will be needed or use of the translation functions in your browser) Kontakt 5 has also a service center where you need to be registered with Native Instruments. I played around with the DrumMic’a plugin for while…and i can just say it sounds damn good…the advanced mic selections, mixer, eq, compressor and the included sound presets really sounds great!!! I must say that I am really impressed and knowing that the software is for free, left me with even a bigger smile. Damn good Sennheiser!! For a free VST library, I don’t think you can find a much better plugin! Sounds are really good. The mixer has mic’s for snare, each of the 3 toms, HH and an overhead for cymbals (2 crashes and a china). Good presets…I like the Metal preset but there are more that sounds very good! I have for fun used the DrumMica sounds in the 2Box module using the SDSE tool to render the DrumMica VST in 24 bits/25 layers. The sounds with all its layers is very convincing and sounds very good with the 2Box module. DrumMic’a can be downloaded here: http://de-de.sennheiser.com/service-support/drummica (It is a bit complex registration process in german…but when you get through this…the world of nice drum sounds opens. Seems like Sennheiser knows what they are doing – good samples! Thanks for all of the work . Did you succeed with this? I have been having the same issue. I have everything downloaded and the final step is to get the activation code but the drumica website does not let me log in! It’s somewhat annoying, I have also been trying for a few days. I have registered (guessing the German) and have got my registration code. Just waiting for the download to finish now. Does the DrumMicA VST has different sounds for Snare center/halfway for positional sensing? No, I can’t recall that the DrumMic’a did support positional sensing…it was some time since I used it…. Today I installed DrumMicA and took a look myself. There are are 9 Sounds related to snare. The notes D1 and E1 sound similar to me, I think there are no separate center and halfway sounds recorded. Does anybody know how to tweak one of the snare notes to make them sound like a halfway hit? Can this be done by EQ settings? Has somebody an idear or link in the internet how to do this?